Resilience has become an important topic on the safety research agenda and in organizational practice. In this chapter we give an introduction to the research area and some of the current challenges, before we present the aim of the book. 1.1 Resilience – What Is It? Resilience has become an important topic on the safety research agenda and in organizational practice (e.g. [1, 2, 3, 4, 5, 6]). Numerous definitions of resilience exist within different research traditions, disciplines, and fields such as sociology, psychology, medicine, engineering, economics, ecology, political science [7, 8, 9, 10, 11]. The common use of the resilience concept relates to the ability of an entity, individuals, community, or system to return to normal condition or functioning after the occurrence of an event that disturbs its state. Many similarities can be observed across the resilience concept applications [8, 9, 12]. We often see resilience research literature referring to dynamic capabilities, adaptive capacity, and performance variation as key topics. Some group resilience literature into three general areas related to readiness and preparedness; response and adaptation; and recovery or adjustment and argue that researchers attempt to broadly cover all three areas in one study, but individually each area receives limited attention resulting in a diverse literature base . Others have identified domains of resilience such as: the Organizational domain – addressing the need for enterprises to respond to a rapid changing business environment; the Social domain – addressing capabilities of individuals, groups, community and environment to cope with external stress; the Economic domain – addressing the inherent ability and adaptive response that enable firms and regions to avoid maximum potential loss; and the Engineering domain – which is mainly adopted within in the safety science as the intrinsic ability of a system to adjust its functionality in the presence of disturbance and unpredicted changes . The resilience engineering (e.g. [13, 14]) domain has attracted a wide readership in the safety science the past decade, although it has a history going back to the 1980s and rooted in cognitive system engineering, human factors, and system safety engineering . The shared use of the resilience term across different traditions does not imply unified concepts of resilience nor theories in which it is embedded . In the resilience literature in more general there has been a strong focus on building theories, however there is lack in empirically proving the theories [9, 15]. This is also true for resilience as it is used in the safety science [10, 14]. The current body of knowledge on complex adaptive systems and resilience has increased our understanding of organizations and the challenges they face in particularly in relation to social and technological complexity, but it suffers from being too generalized and abstract. Identification of what constitutes resilience has hardly been clarified under the onslaught of theorizing and individual empirical cases . A recent systematic review demonstrates that some scientific efforts have been made to develop constructs and models that present relationships; however, these cannot be characterized as sufficient for theory building [10, 17]. Other attempts to model resilience theoretical frameworks (e.g. ) lack empirical testing. The current lack of well-defined constructs is a scientific drawback within the safety science, as it is too unclear which phenomena are to be operationalized . There is a need to develop a coherent integrative theoretical framework of resilience mechanisms to enable large-scale comparative longitudinal studies across multiple high-risk settings and sectors (e.g. healthcare, transport, petroleum, nuclear power) and countries [19, 20]. A major current research challenge is the absent integration of different system levels from individuals, teams, organizations, regulatory bodies, and policy level [10, 14, 21, 22], implying that mechanisms through which resilience is linked across the micro/meso/macro level are not yet well understood. For example, most current research addresses activities of front-line workers (micro level) (e.g. ) and stresses factors of work system design, while top management teams (meso level)  and leadership for organizational adaptability , external contextual factor and regulatory system (macro level) are lacking as key resilience dimensions in theoretical frameworks. Regulation is often the first lever that policy makers and professional bodies reach for to drive improvements in safety, yet the relationship between regulation and resilience remains little explored and the role of regulation in producing or potentially undermining resilience performance, needs investigation and theorizing [21, 25]. The role of stakeholders in resilience is underexplored. Despite the literature within for example healthcare focusing on patient and next of kin as co-creators of resilience, studies lack involvement of stakeholders [26, 27]. High-risk industries depend on collaboration across numerous stakeholders, of potential influence on resilience within organizations and in a societal perspective. In order to understand how individuals, groups, organizations and communities need to adapt and respond to internal and external change and context, stakeholder analysis (e.g. ) could add to the body of knowledge in resilience. This is also of relevance for the practical and operational approaches to resilience in terms of developing targeted strategies for different stakeholders and to establish for example collaboratives for sharing knowledge across levels to foster resilience when it depends on inter-professional collaboration and collaboration across system interfaces (e.g. [29, 30]), and across different conceptualizations of resilience, safety and security which are often in contradiction (e.g. [31, 32]). Currently, this area needs exploration of new approaches to ensure operationalization of resilience as a multi-stakeholder phenomenon. The latter illustrates that there are not only theoretical and empirical research challenges related to resilience research. There are also challenges related to the translation of theory into practice by providing practical guidance to different stakeholders, on how to design and operate resilient organizations and to maintain resilience (e.g. ). There is a need for developing testable propositions and interventions related to resilience and exploring this in guided iterative cycles of design and evaluation [10, 11]. However, how this best should be operationalized is still unclear. 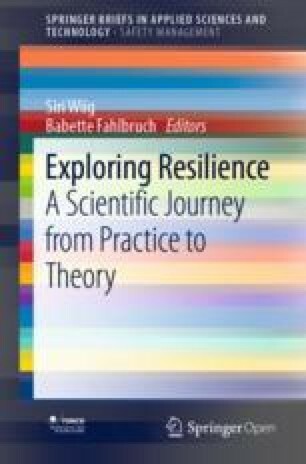 We argue in line with  that it would be interesting to widen the perspective of resilience applied in the safety domain by looking at how other scientific domains operationalize it, and through this may gain new insight and possible improvement in both theory building and translation of theory into interventions and practical solutions. 1.3 What Is This Book Looking for? To explore different approaches for operationalization of resilience across scientific disciplines and system levels. To create a theoretical foundation for a resilience framework across scientific disciplines and system levels. By presenting chapters from leading international authors representing different research disciplines and practical fields we develop suggestions and inspiration for the research community and for practitioners in high-risk industries.